Director Joe Wright has always gravitated towards doing historical period pieces for his film projects. Whether guide towards historical events or just the thrill of doing a costumed drama, Wright has brought several notable films to life. Perhaps his most famous one was his directorial debut, with 2005’s Pride & Prejudice, which starred Kiera Knightley and Matthew McFadden as the famous literary characters of Elizabeth Bennet and Mr. Darcy. Following his film adaption of the Jane Austen’s beloved book, Wright went on to direct Atonement, which was based on novel of the same name by Ian McEwan and starred Kiera Knightley and James McAvoy in the lead roles. Wright received critical praise for Atonement, which was nominated for seven Academy Award nominations and won in the categories for Best Production Design and Best film. From there, Wright several other films, including 2009’s modern drama The Soloist, 2011’s action thriller Hanna, and his 2012’s cinematic adaptation of Lev Tolstoy Anne Karenina. His last project was back in 2014, with Wright jumping head first into big-budgeted filmmaking and J.M. Barrie’s timeless tale with the movie Pan. Set as fantasy prequel to the original story, Pan, which starred Hugh Jackman, Garett Hedlund, and Rooney Mara, was sadly a critical and financial miss, with many criticizing the film for its formulaic plot, over indulgence of computer generated imagery, and controversial cast decisions. 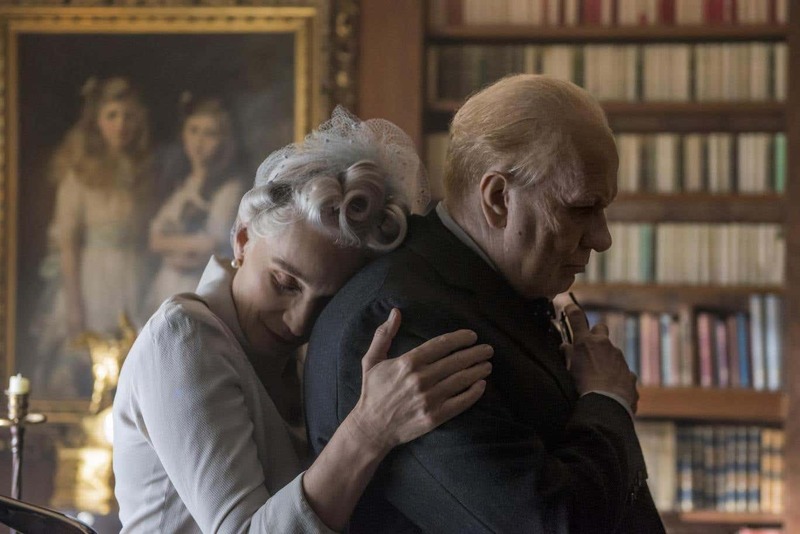 Now, in attempt to bounce back from Pan, director Joe Wright and Focus Features (as well as Working Title) present the film Darkest Hour, a historical biopic on the early years of Winston Churchill as Britain’s Prime Minister. Does Wright newest endeavor find its historical stride or does it fail to translate cinematic revelation from this poignant figure in history? It’s been roughly nine months since the start of World War II and Hitler’s forces are marching through Europe, conquering armies and taking invading countries in an attempt to bring Europe to its knees. As war continues across the Europe, England faces an important decision, with Prime Minister of the United Kingdom Neville Chamberlain (Ronald Pickup) is forced to resign his position due to his lack of progress in the war movement. Though the Conservative Party wishes to appoint the Foreign Secretary Lord Halifax (Stephen Dillane) as Chamberlain’s successor, he turns down the position. Because of this, the Conservative Party is then forced to appoint Winston Churchill (Gary Oldman), much to the dislike of Chamberlain, Halifax, and even King George VI (Ben Mendelsohn). With the support of his wife Clementine (Kristin Scott Thomas, his family, and the help of his newly appointed personal secretary Elizabeth Layton (Lily James), Churchill assumes the position of Prime Minster and is forced to lead the country through World War II. However, even in Churchill’s early days as Prime Minster, Chamberlain and Halifax plot to force his resignation, taking issues with his strong stance on fighting and defeating Adolf Hitler’s Nazi regime instead of trying to make his peace with German firebrand dictator. As France falls to the Nazi forces and Britain’s Allied soldiers struggle to retreat across the English Channel from Dunkirk, Churchill faces increasing pressure from all around him, demanding to abandon his attempt of fighting and to entertain the possibility of entering peace talks with Germany. However, despite all this, Churchill must forge a path that will keep England safe from be overtaken by Hitler’s invading forces. Being a fan of movies, films, and just general cinematics, I’ve several of Joe Wright’s films. As I mentioned above, my personal favorite one would have to be Pride & Prejudice. I know everyone likes the 1995 mini-series with actor Colin Firth as Mr. Darcy, but I actually preferred Wright’s version (love Knightley as Elizabeth and McFadden as Mr. Darcy). I did see Atonement and, while I understand why it was nominated for all its awards, I thought it was just an okay film (a bit dry for me). I never did see The Soloist or Hannah, but I did see Anna Karenina and found it slightly disappointing. The story was there, the costumes and make-up were phenomenal, but the overall style and execution of the film was pretty “meh” to me. As for Pan, I was super excited to see it and was really disappointed with movie’s final result, especially since I love the story of Peter Pan and loved the cast of the film. Of course, this brings it back around to my current review for the movie Darkest Hour. Naturally, I know of Churchill’s importance in WWII as Britain’s Prime Minister. However (and I’m being honest), I didn’t know much about him beyond what I learned in history classes. So, when it was announced that Joe Wright was gonna direct a biopic film on Churchill, I was intrigued. I also remember seeing the movie trailers (many times) during my trips to my local movie theater and seeing the film’s cast (Oldman, James, Dillane, and Mendelsohn, etc.) made me looking forward to seeing this movie. However, despite the film being theatrically released on November 22nd, 2017, it was a limited release and didn’t get a nationwide release until December 22nd, 2017. Even worse, I kept on pushing back myself seeing the movie due to more high-profile films (i.e. Pitch Perfect 3, The Greatest Showman, All the Money in the World, etc.). That said, I did (finally) get a chance to see Darkest Hour towards the end of January, but (again) I kept on delaying my review (sorry about that guys!). So, what did I think of it? Well, I liked it. While there are some problems that the film can’t overtake, Darkest Hour is still a solid biopic drama that carries memorable weight due to actor Gary Oldman’s commanding transformation as Churchill himself. As stated, Wright seems to be drawn towards historical period pieces, which makes him put his so-called “best foot forward” when approaching Darkest Hour. Ditching his visuals flair found in Pan and Anna Karenina, Wright makes this movie grounded and fuels its drama with charged dialogue and powerful performances that propel the film forward. Much a lot of other biopic dramas out there (i.e. The Queen, Lincoln, Sully, Steve Jobs, etc. ), Darkest Hour doesn’t really explore the full “life & times” of Churchill’s life, but rather a specific event in Winston’s life, examining the early days of his role as England’s Prime Minster and the insurmountable challenges he faces (in the role) in steering the nation through the Nazi’s threat that’s slowly overtaking Europe. Rather than charge into the battlefield (they do show a few here and there in the film), Wright keeps the film within the political corridors and war-rooms bunkers. 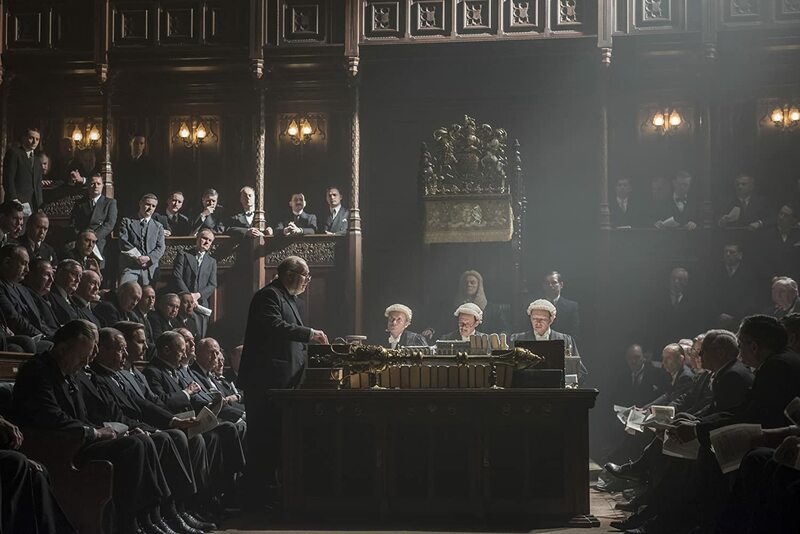 The film’s script, which is penned by Anthony McCarten (Academy-Award nominee screenwriter, playwright, and novelist) weaves an intriguing tale of Churchill’s private and public life, displaying the famous Churchill figure in trying to rally the nation of Great Britain and assert himself as a political leader. While not the most groundbreaking narrative piece, but the Darkest Hour succeeds in being a thematically meaningful (in both a historical piece and cinematic storytelling). As an overall filmmaking presentation, Darkest Hour is a well-made (and well-looking) feature film. It’s nothing revolutionary or groundbreaking, but the movie’s presentation is solidly beautiful, thanks to Wright’s visual background (albeit a bit toned down than some of his previous films) as well as cinematographer Bruno Delbonnel, who creates some impressive visuals with some light techniques and camera angles (several unique upshots), the historical and appropriate costume outfits and designs by Jacqueline Durran, and the slick film editing by Valerio Bonelli help brings the world (sights and sounds) of 1940s England (and its other European outlying areas) to cinematic life. 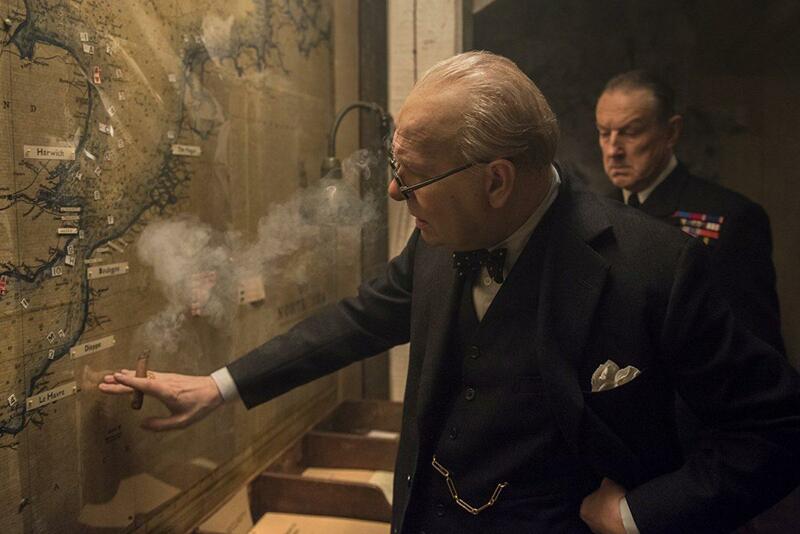 However, the best department of the “behind-the-scenes” team has to be the people who work on the movie’s makeup, wigs, and prosthetics in transforming actor Gary Oldman’s incredibly awesome into Churchill (as well as the film’s other various characters). Hats off to David Malinowski, Kazuhiro Tsuji, Lucy Sibbick, and Diana Choi for their talented efforts in Darkest Hour. Additionally, the film’s musical score, composed by Dario Marianelli, is solid, with some beautiful pieces and melodies playing throughout the film’s proceedings from its big, commanding moments to its more soft, silent ones. Darkest Hour does face some problems within its own cinematic journey of Winston Churchill. For starters (and to address the so-called “elephant in the room”), the film’s narrative touches on the topic of “Operation Dynamo” and the efforts to save all stranded soldiers at Dunkirk. This, of course, makes a notable reference (to many out there) to Christopher Nolan’s 2017 film Dunkirk, which was released several months before Darkest Hour. Naturally, a viewer will make the comparison between the two films (myself included) and it could really make or break for a viewer’s opinion between these two-historical tales, with Nolan examining the overall evacuation event of Dunkirk (through several soldier’s viewpoints) and Wright examining Britain’s leadership and tactical movements towards finally “pulling the trigger” on executing Operation Dynamo. Heck, both films actually (sort of) end on the same note with Churchill’s “we shall fight on the beaches” speech being spoken / recited. Like I said, it’s a tossup on a person’s expectations as some might like Nolan’s unconventional cinematic experience in Dunkirk versus Wright’s intimate (yet straightforward) storytelling in Darkest Hour. Personally, I liked Dunkirk better. It’s just the close proximity to each film being released, which was similar back in 2012 with the release of the two Snow White movies (Snow White and the Huntsman and Mirror, Mirror). It’s kind of hard to explaining, but I think that Darkest Hour (or even Dunkirk) should’ve been delayed to allow each film to breathe fully in their theatrical runs and give moviegoers a chance to digest the subject. Thus, Wright’s Darkest Hour seems to be overshadowed from Nolan’s Dunkirk (and that’s a shame). Another problematic point is that the films is (as it’s presented) an Oscar-bait type movie. This means that the movie has that feeling of being an Academy Award vibe throughout the entire film and sometimes feeling like it’s more tedious with talking sequences and not much action. There’s a lot of talking between many people (public, private, and behind closes doors) and sometimes it gets a bit boring with not much action going on. This means that there’s some pacing issues that disrupt the overall flow of Darkest Hour’s presentation. I draw a similar comparison to Tom Hooper’s 2010 The King’s Speech (i.e. a well-crafted and well-acted movie, but not an enthralling piece of entertainment or not really a re-watchable film after initial watching it). However, I do have to say that Darkest Hour has more “oomph” in dramatic entertainment value (in a lot of areas) than The King’s Speech had. Also (and I forgot to mention this), there’s one particular sequences towards the end of the film that seems a bit “out of place”, involving Churchill taking a ride on the London Underground and converse with the passengers on-aboard. I get why Wright (and McCarten) did this particular scene (for narrative purposes), but it’s hardly believable that the real Churchill would do such a thing. Thus, this scene seems too “movie-ish”. The cast in Darkest Hour is collective group of talented British actors. However, the absolute best part of the movie has to be seasoned actor Gary Oldman’s portrayal of Winston Churchill, which is the film’s main protagonist. Known for his roles in The Dark Knight trilogy, Air Force One, and Tinker, Tailor, Soldier, Spy, Oldman undergoes his most powerful performance in his entire acting career in this role, displaying a commanding and powerful portrayal of Churchill and bringing the almost mythical WWII figure to life (i.e. habitual drinking, constant cigar smoking, and his unique “mumbling” way of speaking). It’s one of the roles that many veteran actors desire for and to sink their teeth into playing as Oldman simply melts into the role, embodying Winston in such a theatrical and entertaining way. Right from the get-go, its clearly that Darkest Hour is Oldman’s vehicle and he does it brilliantly, showing it in his character performance from thunderous dramatic moments to more quieter scenes. The movie does go into a somewhat “hero-worship” of Churchill, making him like a champion of the justice against those who conspire against him. It’s kind of like “Church versus the world” as Darkest Hour never shows the many failing (and they were quite a few) that the real-life Churchill displayed. However, this decision didn’t bother me that much (if not all), but it might for some out there. Still, Oldman’s performance of Winston is hands-down the best, showing the vulnerability, gravitas, and authority of the famous British Prime Minister figure. Again, I have to state the amazing job work in the hair and make-up department for transforming Oldman (physically) into Winston Churchill. Brilliant work! 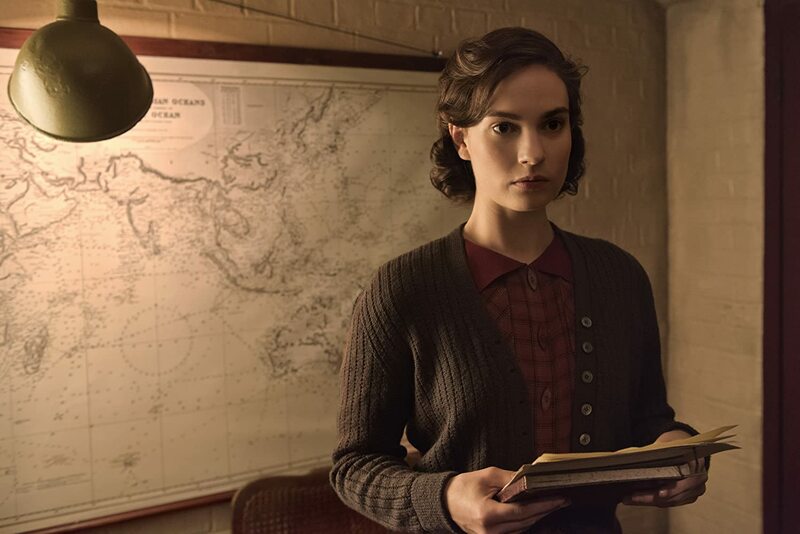 Of the supporting cast members, actress Lily James (Downton Abbey and Cinderella) shines the brightest as Churchill’s young and newly appointed secretary Elizabeth Layton. While not necessarily a impactful character (in the grand scheme of the film), James’s Elizabeth serves as our “viewpoint” into Churchill’s life and showcases the more “human side” (heart, humor, and vulnerability) to the popular historical figure. Still, James’s performance is solid and brings the young secretary to life with charm and charisma. Additionally, by extension, actress Kristin Scott Thomas (Gosford Park and The English Patient) performs a similar function as Winston’s dutiful wife Clementine Churchill, showcasing the warmth and heart her husband’s private persona. Though Thomas Clementine isn’t that quite developed beyond just her initial setup as Churchill’s wife. The other remaining cast members, which includes actor Ben Mendelsohn (Rogue One: A Star Wars Story and Bloodline) as King George VI, actor Stephen Dillane (Game of Thrones and King Arthur) as Viscount Halifax, and Ronald Pickup (Prince of Persia: The Sands of Time and Holby City) as Neville Chamberlain, are well-versed into drama pieces and channel their theatrical acting abilities in their respective characters; seeing as oppositional opponents to Churchill’s position and overall motives. All of these supporting players are excellent in their roles, but, as I stated, Darkest Hour is mostly a vehicle for Oldman’s performance as Churchill, which means that developmental roundness of these said characters are sacrificed. As Hitler’s forces invade Europe, Winston Churchill (England’s Prime Minster) makes a decisive move on what’s best for his country and its people in the movie Darkest Hour. Director Joe Wright’s newest film takes more intimate look at historical figure of Churchill during one of his most important parts of his life and succeeds in an entertaining biopic drama. While the movie does have some issues in pacing and can’t escape from the shadows of Christopher Nolan’s Dunkirk, film rises to challenge with its compelling story, it’s well-crafted presentation, and its solid performances, especially from Gary Oldman memorable portrayal of Churchill. Personally, I liked this movie. While some elements didn’t work within the movie’s limited viewpoint, but I felt that overall feature was well-made, well-acted, and quite a gripping WWII drama, especially since I really didn’t know much about Churchill (I kind of want to know more about him). Thus, I would have to give this movie my “recommended” stamp of approval. Even if you don’t particular care for the film, you have to see it for Oldman’s powerful performance (it’s definitely worth it). While I still believe that Pride & Prejudice is still Wright’s best work to date, Darkest Hour is great biopic drama for the director bounce back on against his disappoint flop of Pan. Still, the movie echoes the determination and leadership that England need in such a “darkest hour” during WWII, echoing Churchill’s famous words “We shall defend our island whatever the cost may be. We shall fight on the beaches, we shall fight on the landing ground7 s, we shall never surrender.” I love that speech! Good review. I’m with you on your score. It’s a solid movie with a great Oldman performance. And I quite liked the supporting cast. Still a bit surprised it’s among the Best Picture nominees. Thank you. I liked it. To me, I’m not surprise that it’s a Best Picture nominee. To me, this movie “oozes” with Oscar-bait. Thanks for the review. Historical movies can be hit and miss but this one sounds like it made the grade. I’ll have to check it out. Thank your for the comment. Yeah, this movie was pretty good. Definitely a hit, especially due to Oldman’s performance.